The Canadian Forces Snowbirds Demonstration Team is marking its 40th Anniversary last weekend with performances at 15 Wing Moose Jaw, Saskatchewan. Based out of 15 Wing Moose Jaw, the Snowbirds are comprised of 85 Canadian Forces members, both Regular and Reserve Force, who come from various military backgrounds and experience. Canadians have been connecting with the Snowbirds and their tradition of excellence for 40 years. 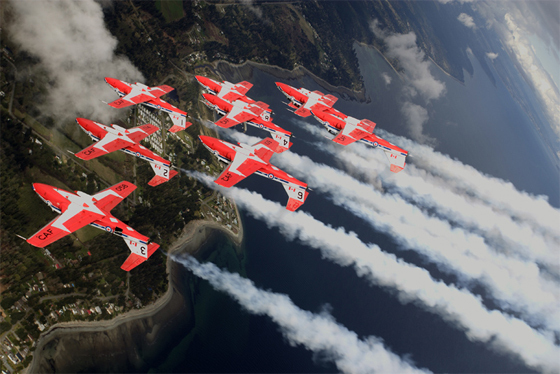 During the 2010 show season the Snowbirds completed 60 performances at 35 different locations around North America. The Snowbirds are the only air demonstration team in North America to perform with nine jets flying in close formation. The 40th anniversary season of the Snowbirds will wrap up over the weekend with many festivities as friends and members of the team, past and present, converge in Moose Jaw to mark the historic occasion. The festivities will culminate over the friendly prairie community when the team will soar through the last performance of the season.